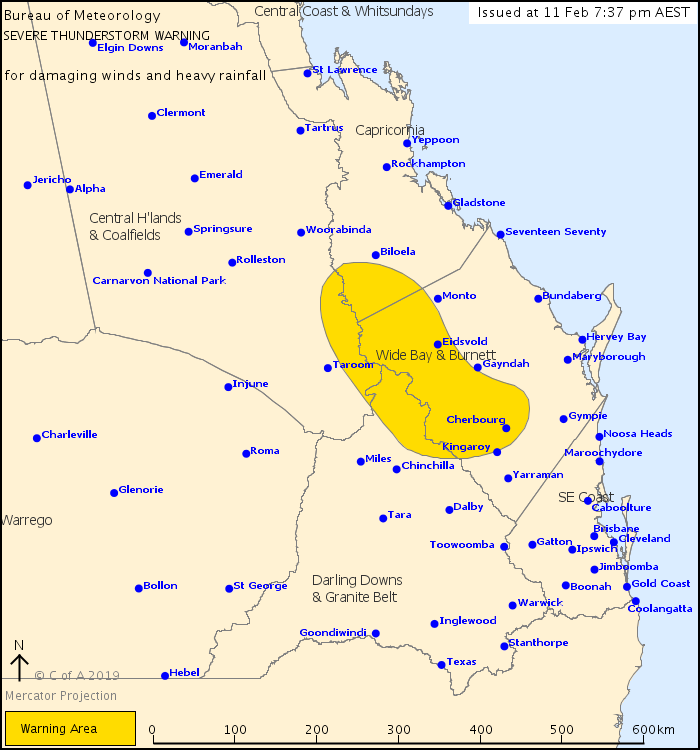 For people in parts of Central Highlands and Coalfields, Capricornia, Wide Bay and Burnett and Darling Downs and Granite Belt Forecast Districts. Issued at 7:37 pm Monday, 11 February 2019. Heavy and slow-moving thunderstorms across southeastern interior. Severe thunderstorms are likely to produce damaging winds and heavy rainfall that may lead to flash flooding in the warning area over the next several hours. Locations which may be affected include Cherbourg, Theodore, Moura, Murgon, Mundubbera and Eidsvold. * Never drive, walk or ride through flood waters. If it's flooded, forget it.